Very interesting article Gary. I read the blog entry on Jim Shooter's site and noticed that he said he and Byrne were having other disagreements around this time? Do you know what those were about? Maybe that could give us more insight into what was going on. If Al Milgrom or Denny O'neil have websites maybe we could get there side of the story on this. What do you think? Zeno. You can read the book Modern Masters which includes a long conversation with Byrne. He said Shooter objected some issues of Fantastic Four even though the editor of the tittle gave them the ok. Byrne left the FF and Shooter fired the editor making him responsible for Byrne's departure. Shooter also went after the tittles that sold well and tryed to impose his ideas...cause he thought that HE was Marvel...that's what Byrne said. 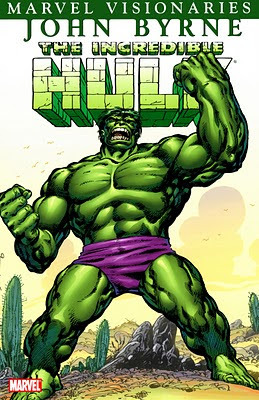 Have you asked Shooter about the Barry WIndsor Smith Hulk story that Smith claims to have submitted? I don't know if Shooter has ever talked about that. I actually found you when I was perusing John Byrne's site (which I can't join as I only have an AOL e-mail account!). Have you read any of the comments on your posts over there? MOCK!, Gary is a member of John Byrne's forum and posted in the thread discussing his fine articles. "Although the stories themselves may be lackluster in certain facets…"
So I'm reading along, and thinking This is all WAY too positive! Does this guy actually have the stones to simply say he LIKES what I did, and damn the Byrne Bashers? Then I hit that line, and the cosmic balance was restored. It's hard to be a John Byrne fan. Unless you are 100% at all times positive about him you have no "stones" and are appeasing Byrne bashers. I never did reply to Mr. Byrne over at the board, mostly because everyone who speaks out to disagree with him, no matter how well-reasoned, always seems to end up never being seen again. And if he didn't like what I said before, I'm confident he wouldn't like this entry at all! Glad everyone enjoyed my series of articles...well, mostly everyone, anyway. Look for a follow-up with another early Hulk writer soon! You write great, informative articles AND you know the best way to deal with Byrne is to not deal with him at all? Today, you are the winner. Just saw this article. Loved it. I know how this will sound. But back at Mid-Ohio con I saw Byrne there. Back when he was doing superman. He was talking to someone. Don't remember who, but it was about the Hulk. Byrne was having an animated conversation with this gentleman. It was just before the sit down signing that was done at that time. I heard Byrne clearly state that it was "shooter who made it clear he should leave". You can take that to mean a hundred different things. but as you stated. Byrne was lead to think it was Shooter who nixed his splash page issue. And he may have felt that it was time to go. Peter David - far from Shooter's biggest fan - has confirmed Shooter's account of the Kirby/Marvel mess. These are firsthand accounts. Considering Groth a) wasn't there and b) is a Kirby fanboy of the most rabid sort who got most of his "facts" from Kirby himself (or Mark Evanier, who at least acknowledges Kirby's habit of 'misremembering') - and considering that Kirby's decades of lying are a matter of public and legal record (did you know Jack created Superman? and Joe Simon had nothing to do with Captain America? and Stan Lee never wrote a word of dialogue - pity Jack *ahem* lost his touch with dialogue as soon as Stan's name stopped appearing alongside his own. and that Ditko was so incensed by Kirby's claims re: Spider-Man he forced Kirby to apologize?) - the evidence speaks for itself, imo. I haven't seen ANYONE who was actually there back up Kirby's/Groth's ridiculous slanderous libelous claims, though there are plenty who refute them.